The fear of a parent forced to watch a child make their own way in the world animates Unless, the new film based on a Carol Shields novel and written and directed by Alan Gilsenan. 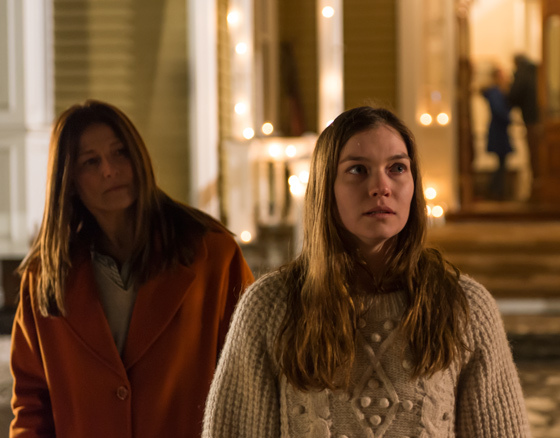 Reta (Catherine Keener) has a lot of roles in life. Besides being a mother to three young women and wife to an Orangeville doctor, she's also an author and a translator; in the former role, she guides herself, deciding her own path; in the latter, she's left to interpret and follow, a fate that's the uncomfortable destiny of most every parent. As the film introduces Reta and her family, they're in a blissful breakfast scene, full of fun bickering and warmth. Cut forward and Reta's received a call: her daughter Norah (Hannah Gross) has been sitting on a sidewalk in Toronto during the day and sleeping in a women's shelter at night. She's unresponsive, unwilling to accept any help, and holds a sign that says only "Goodness." The situation forces everyone into the role of spectator, and all are given the opportunity to share their perspective. Of all of them, though, from Norah's ill-defined sisters to her frustrated dad, it's Reta who gets the most focus. In clipped scenes that begin and end without finding traditional arcs, Keener's edgy presence navigates the expectations of those around her — the half-dozen people who believe they know exactly what's needed — all while she's searching simply to understand why this is all happening. While Reta is left trying to understand the absence left by her daughter, Unless lays out fragments to be picked up and stitched together into meaning. Norah spends her days sitting on the sidewalk in front of Toronto's Honest Ed's, whose signs pop up in the corners of shots to hint at significance. "Something!" cries one. "This happens once in a lifetime!" another. "And get lost!" still another. Strife in life doesn't necessarily come with its own narrative flow, especially when it's the struggle of watching someone close to you deal with hardship. But too much of Unless simply passes by, followed by an ending that doesn't quite work as one.